Wow! I can’t believe 2016 is upon us. 2015 has been one crazy ride, and who would’ve thought that my little corner of Bookstagram that I started in May would rocket to nearly ten thousand of you lovely people coming on this journey with me! Thank you, truly, to each and every single one of you. And if you’re from the equally-awesome Booklr community, a heartfelt thank you to you too. You are what makes this community so lovely to be a part of! 10 were audiobooks, equalling 181.5 hours of audio, or 7.5 days! Hope you all enjoyed this little journey down memory lane! So many amazing books read, yet so many more to go. 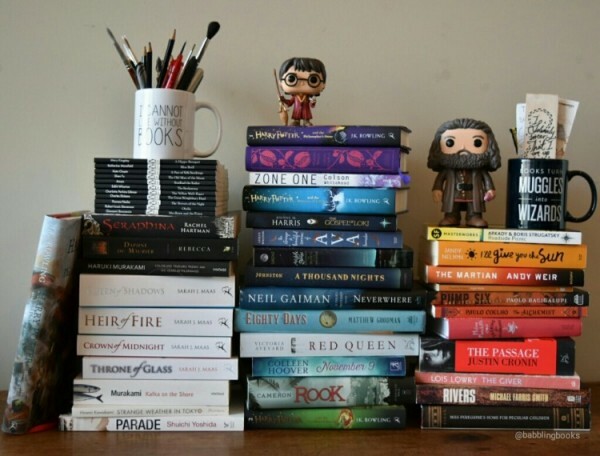 What were your favourite books of 2015, and what are you most looking forward to reading in the new year? What an amazing amount of reading!!! You’re my inpiration for this new year!! I’ve been thinking about getting A Throne of Glass.. would you recommend it to anyone?? I’m María from teasplusbooks by the way!!! :) just discovered your Blog, better late than never I guess!!! Throne of Glass was one of my favourite series I read in 2015, and the fourth book, Queen of Shadows, made it into my top 5 fantasy reads for the year. The first book (Throne of Glass) is not perfect. She wrote it when she was 16 or 17, but it’s worth sticking with it because it just gets better and better.